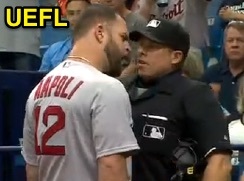 HP Umpire Tripp Gibson ejected Red Sox 1B Mike Napoli for arguing a strike three call in the top of the 2nd inning of the Red Sox-Rays game. With one out and none on, Napoli took a 3-2 slider from Rays pitcher Chris Archer for a called third strike. Replays indicate the pitch was located over the outer edge of home plate and thigh high (px 0.857, pz 1.799 [sz_bot 1.450]), the call was correct. At the time of the ejection, the Red Sox were leading, 1-0. The Red Sox ultimately won the contest, 5-3. This is Tripp Gibson (73)'s fourth ejection of 2015. Tripp Gibson now has 17 points in the UEFL Standings (13 Previous + 2 MLB + 2 Correct = 17). Crew Chief Brian Gorman now has 19 points in Crew Division (18 Previous + 1 Correct Call = 19). This is the 110th ejection of the 2015 MLB Regular Season. This is the 51st player ejection of 2015. Prior to ejection, Napoli was 0-1 (SO) in the contest. This is the Red Sox' 7th ejection of 2015, 1st in the AL East (BOS 7; BAL, NYY, TOR 4; TB 3). This is Mike Napoli's 2nd ejection of 2015, 1st since May 29 (Todd Tichenor; QOC = Y [Balls/Strikes]). This is Tripp Gibson's first ejection since May 19, 2015 (Brad Ausmus; QOC = Y [Balls/Strikes]).